My sweet stepdad, Gibson's birthday is this month. Tres' birthday will be this month. But today, is Miss Lauren Hogan's 25th birthday. Since she's living in Charlotte now, I could meet her at East Blvd. Starbucks for a coffee, then we could go to Cantina for lunch or maybe just grab a sandwich at Laurel Market. I would definitely give her some of those bottom of the feet detox pads since I know she's always been curious and and I'd also love to give her - oh, say, a million dollars. None of those things am I able to do this morning - but I do love & miss her and want her to feel appreciated so, I will give her this - a picture of my massively oversized 35.5 week pregnant belly. Just for giggles. Don't adjust your screen Lauren - that whole gift is just for you. I know Tres will love you just as much as our other kids do. We miss you, lady. When we were praying about coming out here to be the houseparents at New Beginnings, I kept getting so excited about being their for the birth of babies. I would picture myself holding their feet and grunting with them, maybe quietly shedding a tear when she did the final push - standing silently on the side of the room the first time she held her baby. I constantly would tell people, "it's like your birthday every day!". Outside of Jesus & my family, labor and delivery is about one of my favorite things in the world. We've had twelve girls live here over the course of the year and because of circumstances, I've only gotten to be present when one of the babies was born - and it was a c-section. For a few Nick has been out of town, for some Glory had just been born, and in general - I've just not been able to be there. Lauren has been a great assistant and is there for them, but in the back of my heart, I'm always dying a little bit when I get the text in the middle of the night saying the baby is out & I'm at home - wishing I could have been there. Switch the focus to Victoria, one of our newest girls who we are pretty much in love with. Right after her interview, I told Nick, "I want her baby". Of course, I was kidding - but she is truly the whole reason we think New Beginnings exists. She has a great, supportive family - but just needed some time and space away for the end of her pregnancy and birth, to feel taken care of and get some peace. We got a major little shock tonight before dinner when we found out that she is going to be induced tomorrow due to some minor complications. She really only just found out she was pregnant a month or so ago, and tomorrow she is going to be a mama. The adoptive family that is going to raise her baby just found out that they're having a baby tomorrow too, & they're coming tonight to meet her. Right now we're in the middle of an emergency childbirth class and after this we have about a zillion things to do to prepare. She is still in a bit of shock, but her sweet little heart is taking it all in stride. If you would, pray for her tomorrow. Pray for her sweet baby girl, for their new family. Pray for her biological family and the doctors who will take care of her. And if you think of it, pray that I'll be able to contain my excitement because I will actually get to be at the hospital WITH Lauren if everything goes as planned. It is one last hurrah for us together and a really sweet gift from the Lord. I mean, it's all really about Victoria tomorrow, but I'd by lying if I said I wasn't about to pee my pants. But don't worry - I'll keep a calm face and won't mention that I feel like it's my birthday because I'm so excited. categories: "Lauren", "New Beginnings", "babes"
Sorry if the title confused you and you thought I was going to have a good word for you today, friends. Nope, this is just a blog bash in response to Lauren's lost theory. - I do indeed iron my sheets & I will not apologize for it - do it once & you'll never go back. - I do not get confused about Lost, I'm on the same page with the writers and I believe I could write the ending better than they themselves can. - I don't agree AT ALL with her trinitarian lost ideology. Not in the slightest. 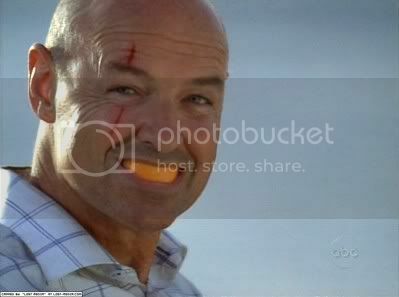 - John Locke is obviously not the messiah of the island. Everyone (Ben, Richard Halpert, & now Charles Widmore) is taking advantage of his crazy faith in the island. They're telling him he is special and he is nothing more than a pawn. Does the island bring him back to life? SURE. Did it de-paralyze him? Sure. Did it do the same thing for Christian, Jack's dad? Yes. If you have any sense at all you can deduce that John Locke is no more special than anyone else. When he leaves the island, he becomes an accident prone fool once again. - I also do not agree with the trinitarian theory because I believe that the major villains would like us to believe there are religious undertones to the island's power - while truly they are all scientific. If ANYONE should be the messiah, we should look to Farraday. Yes, the crazy skinny scientist who in truth - has probably been alive since the time of the real Messiah (Jesus, not John Locke - since John Locke is nobody's messiah) himself. Farraday is the key. - The pepper monster is nothing more than a biproduct of the space time continuum & should not be considered be linked with the Holy Spirit in the slightest. Oh, and Jacob? Come on - he is the ultimate sham. Now, you can take your Lost advice from anyone you choose but here is where I rest my case. What Miss Hogan did not tell you is that last night, on the verge of tears, she pleaded that she herself needed a 'constant' to help her make sense of the time-flash-changing-phenomenon. I did not need such help. I would just like to know where baby Aaron is, thank you.